Whether you are a fan of Antoni Porowski and his avocado obsession, or Karamo Brown and his tips for success, you can't help but admire the mysterious and fashionable Tan France. While the stylist describes himself as the "quiet one" of Queer Eye's Fab Five, he's starting to open up about his thoughts on all things fashion, relationships and life. "I want to give people some background on me," the Brit told E! News in an exclusive interview. If you want to know more about the more elusive member of the Fab Five, check out the five things we learned from our chat with Tan below! He Has Bieber Fever: Believe it or not, the 35-year-old U.K. native is actually a fan of Justin Bieber's fashion choices! "No joke, I actually love Justin Bieber's style," he shared. Much like when he is on Queer Eye, Tan encourages everyone to dress the way they want. "I love that he's super experimental. I wouldn't push my agenda on him; I don't want to ever force what I think is appropriate onto somebody. Especially when you're young, play with style," he expressed. But France did say, "The only thing that I'm not loving is the fact that he wore his hotel slippers out a couple days ago, but I think his style is cool." Famous Friends: After helping Pete Davidson revamp his style in a funny video on Saturday Night Live, he and the comedian have grown to become great friends. So close in-fact, that Tan recently revealed to Page Six that the 24-year-old enlisted him to help plan his attire for his wedding to Ariana Grande. And while he's excited for Pete to marry the pop star, France is keeping the details of the big ceremony to himself. When asked about the nuptials, Tan responded, "I do not talk about my friends. He's a very close friend of mine." Family Matters: Despite being married for over 10 years, his partner has yet to meet his family in person. 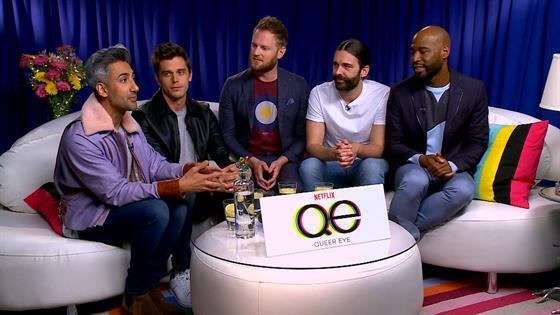 While appearing on co-star Jonathan Van Ness' podcast, Getting Curious, he revealed that before Queer Eye, his family never spoke about his sexuality or relationship. As he explained, "But when they finally watched the show and they said, 'It was so much better than we expected, you've done us so proud. You're just who you are'." Tan, who hails from Yorkshire, England, has been nothing short of busy since Queer Eye was released—meaning that visiting his family across the pond is close to impossible. "We've got press plans for the next four and a half months so not yet," he said when asked if his family and partner have had the chance to meet. Until then, the star and his husband use Facetime to stay in touch. "The nice thing is that with Facetime, I sit there with my tea and coffee, they sit there with their tea and coffee. It feels like you're hanging out with them," Tan said. He Is Adding Author to His Resume: Fans of the fashion guru who are itching to know more about Tan can expect an autobiography to be released in the coming months. France told E! News, "I'm looking forward to be able to tell the audience what it was like for me going from my small town of South Yorkshire in England to this crazy little life that I live now." Tan Is Using His Newfound Fame for Good: The Queer Eye star is teaming up with Men's Wearhouse to give unemployed Americans the tools they need to ace the interview and look good while doing it. Similar to his role on the Netflix show, the stylist wants to help men find clothing that improves who they already are. "I show them a better option for them, and try to create the best version of themselves. This is exactly what Men's Warehouse is doing; they are not trying to change the person. They are just saying look if you want the job you probably need to dress appropriately for it, and let's help you out." He continued, "I think clothing is super powerful. When I get dressed in the morning, if I don't feel like I look steezy A.F. I'm not going to be in a good mood that day. So I want every person that we help to feel that way. I want them to leave the house thinking I look fantastic and I can achieve whatever I want to achieve today."